Dusky Dolphins love to spend time surfing in the wake of boats which is what these dolphins just finished doing for a tour with Encounter Kaikoura off the South Island of New Zealand. Dusky Dolphins as well as other species of dolphins and whales, love to frolic while surfing alongside or behind boats. The passengers aboard Encounter Kaikoura off the South Island of New Zealand were just entertained by this group of Dusky Dolphins performing their surfing techniques. The bluish black colors on the backs of the Dusky Dolphins can be seen spread out across the surface of the water after surfing as some bow out sooner than others. Their dorsal fins are also bluish black in color and are easy to spot especially in calm waters but when they leap from the water, one can get a good look at their white underside. Many times, the dolphins will charge towards the vessel with Encounter Kaikoura when the engines are running in hopes that they can jump in the wake and practice their surfing skills. Dusky Dolphins can range in group sizes from two lonely dolphins to a massive group of up to one thousand which spread themselves across the water off New Zealand. As many as twelve to twenty thousand Dusky Dolphins reside in the New Zealand waters, spreading farther out during the winter as they need to follow the food. Surface feeding is usually done in large groups followed by aerial displays and acrobatics, all part of the synchronized foraging method. 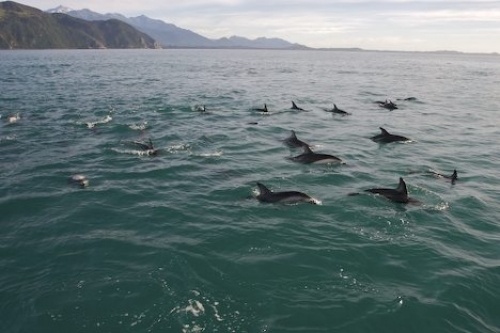 For a Dolphin Watching tour while in Kaikoura, New Zealand, be sure to look up Encounter Kaikoura for an experience of a lifetime. Thousands of Dusky Dolphins reside around the waters off the South Island and chances are you will see these cute sea animals surfing, leaping, playing, resting and feeding while on your adventure. Dusky Dolphins during a dolphin watching tour with Encounter Kaikoura, Kaikoura, East Coast, South Island, New Zealand.